Effect - Destroys one magic card on the field. If the target is face-down, flip it over. If it is a Magic card, destroy it. If it is not, flip it back over. The flipped card's ability is not activated. -Could get rid of something that your oppenent has been saving up for you, and then you force them to discard it. -Gets rid of spells what more do you want? -Doesn't get rid of SorL when it is activated. -can be a waste of deck space. The only reason why this card is even average, is because it can get rid of magics your oppenent wanted to save for later, but if you are either A) Lucky or B) just know what your oppenent has, on their field, then this card isn't bad for you. Otherwise it is a magic that gets rid of a magic..... hm Spiffy, I think, or maybe not. Well, the biggest reason why this card kind of is on the bad side, is because it doesnt get rid of sorl! You are all saying well it should, because it is a face up magic, no it doesn't. The reason it doesn't is because when you activate sorl its on a side of its own. Its kind of hard to explain, but its already in play. For instance you could use de-spell on an equipment magic, but with sorl its already being used, and you can not use de-spell on a card thats in use, and is not being used meaning if it is not face up, and you flipped it over via de-spell then well you would discard it. So yea this card has limited uses. Combos: This card can be used with trap master or stern mystic to see what your oppenent has on the field, and then you can de-spell it, since you would know what it is, and it wouldn't be a waste of a card. There are no other combos with this card, besides cards that allow you to see your oppenents magic/traps. Combos? None that I can think of. Rating: 3.7/5 – You need one in every deck. It’s TeCh for YuGiOh. Trust me on that one. De-Spell. A simple card, but useful. Basically, you destroy a Magic on the field. That’s nice. A combo with it is using The Stern Mystic to scope out their Magic cards, then let loose a De-Spell. Also, if your opponent just played a Card Destruction and played a face-down Magic, nail it with De-Spell. More often than not, it’ll be a powerful Magic-type card. De-Spells are also useful for crippling your opponents monster if it has been pumped up by equips. In later sets, there will be negative equip cards you may need to remove. But the main use is Swords of Revealing Light. It won’t remove the initial flipping of your monsters, but it will enable you to attack. 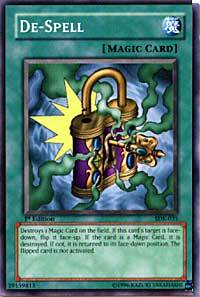 Basically, you can use De-Spell to look at any magic/trap card on the field. Then, if it's a Trap that you don't like, you can always use Trap Master and get rid of it. If it's a magic, it's destroyed, so there goes that problem. De-Spell is an interesting card. If you guess right on a Magic card face-down, you could destroy a Raigeki or Change of Heart! But, if you guess wrong, it's a waste of the card. If your opponent has a Swords of Revealing Light in play, they may think they're safe and not put any monsters out. You could De-Spell it, then play something like a La Jinn and do 1800 straight to them!